Thirty Basque men, women, children and seniors stand in the rain silently, forming a long human chain in front of the Kursaal Building in San Sebastian. The modern, stylish building stands triumphantly over the beach and the old town, a physical symbol of the Basque people’s opening their doors to the world and a peaceful future. The demonstrators at their door hold pictures of a convicted member of the militant Basque separatist group, ETA, and their message is much less ambassadorial, more personal, poignant, and polemical. My friends and I pass their long line, reading the signs they hold solemnly to a passing crowd of mixed sympathies and bewildered tourists. 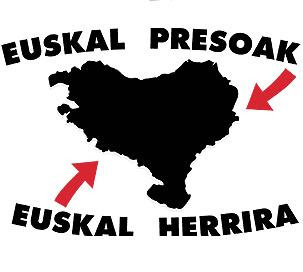 I look at the images of prisoners, unintelligible Basque phrases, their red, green and white flag, and the map of the un-official borders of Euskadi, with the label Euskal Presoak etxera, a phrase I now understand to mean, Basque prisoners come home. 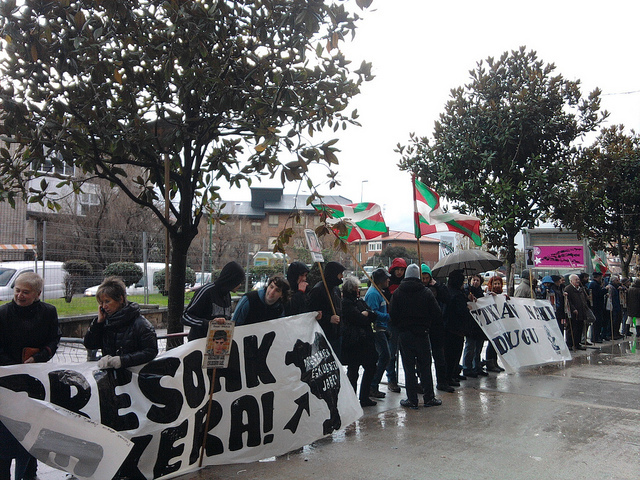 Such protests are a common sight in the Basque Country, though when I first arrived here I was unaware of their significance. I made my first trip to San Sebastian while working as an English teacher in a small village in rural, conservative Old Castile, deep in the Spanish heartland. From the languid villages of the meseta, it was difficult to imagine that people in the north were fighting for their independence. I researched the conflict online, discovering a complicated and bloody battle going back centuries in time. Before I left for San Sebastian, the philosophy teacher took me out for a beer and attempted to fill me in on the situation. He pulled out a napkin and drew the map of the Basque Country, the three French provinces and four Spanish provinces that made up “Euskal Herria,” the unrecognized “Land of the Basque Speakers” straddling the Pyrenees. He then drew the arrows pointing inwards from Spain and France, forming the flag I now saw the protesters holding in the rain. He did not write or explain Presoak etxera. I nodded, folded up the napkin and put it in my jacket pocket. I suspected he’d provided me a facile explanation that lacked the profundity of thought expected from a philosophy teacher. I decided to reserve my judgement until I saw the situation for myself. I saw the flag everywhere in the Basque Country. It hung from windows of homes, from balconies of the old town, from behind the bars of taverns from Bilbao to Biarritz. It was so ubiquitous, I couldn’t believe that everyone who held it was as evil as my co-worker made them out to be. I tried to avoid talking politics as long as I could. But after a few beers at a local tavern where the flag was printed on the napkins, curiosity got the best of me. He looked me gravely in the eyes, pushed off the bar and went back to drying pint glasses behind the bar and talking to the other patrons in Basque. I left my inquiry at that, knowing that the issue was far more complex that I could fathom at that time. I felt the weight of centuries of mutual mistrust and anger pressing down on the shoulders of both this bartender and the philosophy teacher back in Castile. Though I laughed nervously about the irony of the incidents at the time, they revealed a deep misunderstanding and paranoia on both sides of the conflict. 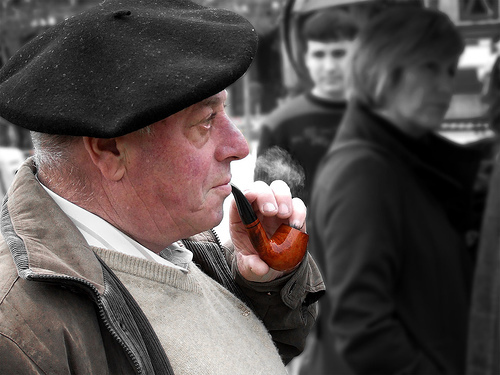 During my first year in San Sebastian, I avoided the subject of ETA, learning to celebrate the uniqueness of the Basque region without focusing on the more radical elements of the independence movement. I fell in love with the Basque Country. There I discovered a nation without a country, a people with a long history largely unknown to the world, and a culture that drew me in and mesmerized me. I realized that if so many cultural treasures lie hidden within well-trodden Western Europe, the world beyond the West must hold enough diverse cultures to fill a lifetime of discovery. And so now, when I see the demonstrators standing in the rain, holding up pictures of convicted terrorists, I understand that the faces in these photos are their sons, sisters, cousins and friends. The conflict is personal for everyone involved. There are bloody hands and innocent lives lost on both sides of the battle. Many heated conversations have made me realize that the longest continuous conflict in Europe can not be solved by me alone. Then I think back to the philosophy teacher who told me not to talk to the bartender. I think about the Guardia Civil and the activist, and the chasms that separate their perspectives. Then I realize that these divisions and misunderstandings are preserved by silence. And so I keep talking and writing, because it is only through communication that we can hope to forge the mutual understanding we need to build peace.